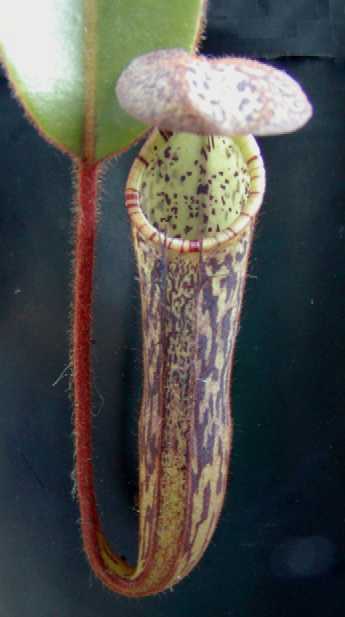 Nepenthes stenophylla is very similar, if not the same plant, to Nepenthes fallax. I've seen it listed as two different species, or one in the same. I have no idea which is correct. This plant has somewhat hairy tendrils that standout from other Nepenthes. It is very cylindrical with a nicely striped peristome. I like this plant a lot! I've seen some pictures where the pitcher has a whitish tinge to it which makes it look even better. For the longest time it seemed to stay kind of dormant never really producing any nice pitchers but didn't go into stress either. It just "sat" thinking whether or not to grow. Then it finally took off and is producing larger pitchers and leaves. N. stenophylla is an easy grower with little to no problems cultivating and widely available. I have read that it is somewhat of a slower grower compared to other highlanders. I think I agree.